MagneQuest: Have You Met Our Robin Hood Series? 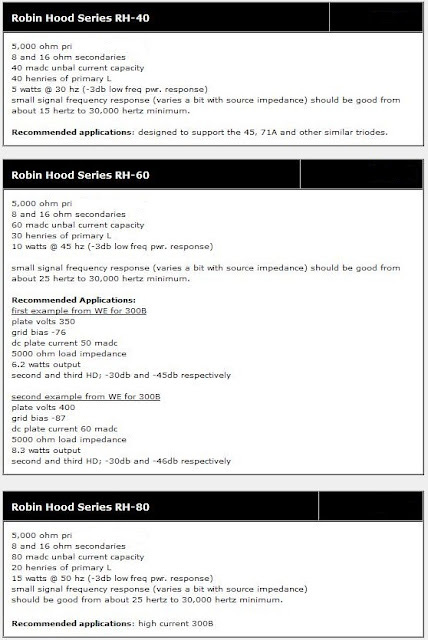 The Robin Hoods' series consists of three single-ended air-gapped output transformers. The aim of the series is two- fold. First is to offer a transformer for folks who are bi-amping and don't need the huge inductances and AC power capabilities of say our legendary FS-030 single ended output transformer. The second aim/goal is to make these the best VALUE output transformers available in the marketplace. The "Robin Hood" series is named in honor of the man who took from the rich, as in the richness of MagneQuest's proven designs, to give to the poor, as in DIY lovers who crave high value without sacrificing top quality. The primary copper circuit is smartly crafted to keep resistive losses at a minimum (the dcr is approx. 185 ohms). The copper losses from the full secondary and the full primary are equal in magnitude. The primary inductance is carefully designed to fully support the published low frequency extension of each model at the maximum stated power level. The total (AC and DC combined) magnetic flux density is kept BELOW 16kg in each model offered in this series. Therefore, these will not saturate or "run out of iron" when used within their published specs. Simply put, these are expertly designed transformers with an emphasis on sound quality. We didn't skimp in the goodies department. All of the RH series are made with pure Teflon insulation on the inside. All solder connections are made with silver bearing solders. All units are housed in channel frames with easy to solder to terminals. They are as easy to install as they are musical in their sound delivery. Currently, three different models are available in the following configurations. All have 5K primary impedances. Here are the specs for the RH-40, RH-60, and RH-80 which cost $125 each.